8 Apr - Results, photos and videos posted. 14 Mar - Schedule provided by organizer. 5 Mar - Competition moved to 3-4 April (Tue-Wed) by organizer. It was previously scheduled 5-6 April. Venue was also moved to Thammasat University Sport Complex. 26 Feb - SEA youth organiser has extended our submission of the final entry form to 12 March. 7 Jan - Page posted. 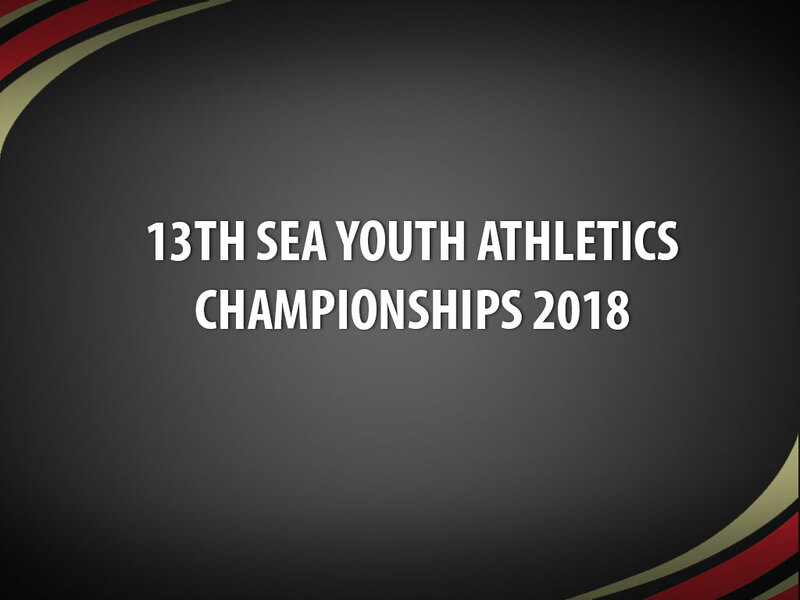 Singapore Athletics Association (SAA) intends to nominate all athletes (except for relays) for the 13th SEA Youth Athletics Championships (SYAC) who have achieved the criteria. A maximum of two athletes from any one Member can compete in each event. The tentative travel dates will be from 3rd to 7th April 2018. The qualifying period lasts from 01.01.2018 until 04.03.2018. 3.2 Only athletes aged 15, 16 or 17 years on 31 December 2018 (born in 2001, 2002 or 2003), may compete in any event. The athletes who are in born in 2003 are not allowed to compete in the discus throw and hammer throw. 3.8 Not used or administered any substance which if it had been detected as being present in the athlete’s body tissue or fluids, would have constituted doping, or used any prohibited method or committed any other doping offense as defined in ADS’s, WADA or IAAF’s Anti-Doping By-law. 4.1 All achievements submitted for consideration should have taken place at SAA/IAAF sanctioned championships and trials, but athletes may submit the achievements from overseas championships and meets of athletes studying in overseas tertiary institutions. However, these have to be properly accredited and sanctioned to be accepted (written confirmation by SAA upon sending an email to SAA). 4.2 Achievements from overseas championships have to be properly accredited and sanctioned to be accepted. However, these have to be properly accredited and sanctioned to be accepted (written confirmation by SAA upon sending an email to SAA). 4.3 For 100m, 200m, 100m / 110m hurdles, long and triple jump events: only performances with legal wind-speed will be accepted. 4.4 For all track and road racing events: only performances measured by using an electronic timing system will be accepted. Road performances will be accepted for race walk. Any eligible athlete achieving the entry standard mentioned in table 1 during the qualifying period will be considered for nomination. 8.1 The first [1st] and second [2nd] ranked athletes in the 2018 season’s ranking (01.01.2018 – 04.03.2018, comprising competitions mentioned at 5.) for all events will then be selected for SYAC nomination. 8.2 In case there is a tie between two or more athletes, SAA will compare and choose the athlete’s 2nd best performance and so on, achieved in the respective period (comprising competitions mentioned at 5). 8.3 SAA reserves the right not to nominate an athlete/team to represent Singapore in the SYAC if, in its sole opinion, the athlete/team concerned cannot meet the fitness and performance targets set by SAA. 8.4 Athlete/s shall be required to be certified medically fit to compete at the SAYC by qualified SSI personnel prior to nomination to the SAYC, and shall remain medically fit to compete to be eligible to compete in the SAYC. 9.1 The Technical Director or another staff member of SAA’s sports development and performance team may be the Head Coach / Team Manager for SAYC if there is a need for a Head Coach / Team Manager. 9.2 The number of team coaches selected will depend on the number of athletes selected and will be determined by the number of accreditations provided by the organiser. 1st priority: One [1) coach for each of the event groups (sprints / jumps / pole vault / throws / middle & long distances + race walking / multi-events) in which Singaporean athletes are competing at. The coach who is dealing with the highest ranked athlete will be selected first. The coach who is dealing with the next ranked athlete in another event group will then be selected as the 2nd coach (and so on). 10.1 Where there is a conflict or dispute in respect of these Guidelines for the nomination of athletes to represent Singapore in the WJC, SAA reserves the sole right to interpret this document and to use its discretion in the resolution of the matter in conflict or dispute. 10.3 Athletes may only appeal on the grounds that the nomination event was not executed in accordance with its notice of race or the nomination process was not carried out in accordance with this policy document. Based on 3rd placing of previous championships. # The athletes who are born in 2003 are not allowed to compete in the discus throw and hammer throw.